Meanwhile Google Plus came out, an underground new beverage (let’s stick with the metaphor), that only nerds, geeks and hipsters (here sorted by increasing order of coolness) knew about. Google+ is no longer a computer-enthusiasts-only. 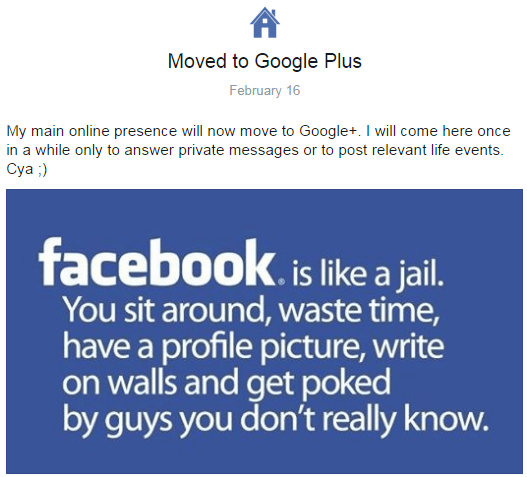 Google made a lot of effort to make this social network appeal to anyone, integrating it with its other services (e.g. Youtube comments) and mobile devices (e.g. Glass). It’s not really Facebook vs Google+ since each has its advantages and shortcomings. Reaching the masses, since virtually everyone with a web presence is on Facebook; even your grandmother is there, probably your dog too! Showoff your personal achievements. I must admit Timeline is a remarkable idea. It allows you to post special status updates that represent a major event in your life. They are displayed with more impact and allow you to view your year in review in a neat and organized way. Finding curated and relevant content. Google is a searching company so – surprise, surprise – it’s really easy to search any content posted to Google+. You can either search for a term, or have a look at Google’s Explore tab. It will show you which hashtags are trending, the most popular posts at the time, which pages you might like, and which persons you might want to follow. And there are lots of interesting writers, photographers, tech experts, actors, you name it, that post interesting content. Networking. When you post something, Google automatically guesses the relevant hashtags. That way your posts benefits of others that are talking about the same thing. At any time you can see what’s trending, just like on Twitter, and join the conversion. You can easily start following someone without forcing them to do the same. No more that awkward feeling of accepting a stranger as a friend. Hosting events. Share your event and let others join in as attendants. Everytime they take a picture during your event that photo is displayed on your event page. The most liked photos are highlighted. All this automagically. When will your event’s photos be online? Well mines’ are uploaded in realtime, booya! Joining a community. Facebook pages are usually one way communication channels. You seldom get replies from large pages or groups. Google+ communities are (sometimes) smaller but (always) more active. That means more answers, more content, more networking. Hangouts on air. Yes, Google+ is also a Skype; you can video call anyone anywhere, for free, without asking your contacts to join yet another online service. Just install a browser plugin and you’re ready to go. Hangouts on air also enable your event to be broadcasted on youtube, so your audience doesn’t even need a Google+ account. And when the event ends well it’s already on youtube. When will your event’s video be online? Well mine’s already online, live for the world to see, booya! Facebook is all about numbers (of likes), popularity, and gossip – which makes it great for (viral) marketing. Google+ is about your friends (circle of trust), sharing great content and actively participating in communities of interests. And while Facebook seems to be decaying, Google+ is only getting better – as Lifehacker says, Google+ Does Everything. For a more in depth review of its advantages go check their post. From now on I’ll only use Facebook for its timeline. My main online presence will move to Google+. Find which one suits you best.